Director – Ang Lee, Screenplay – James Schamus, Tsai Kuo Jung & Wang Hui-Ling, Based on the Novel by Wang Du Lu, Producers – Ang Lee, Hsu Li-Kong & Bill Kong, Photography – Peter Pau, Music – Tan Dun, Cello Solos – Yo-Yo Ma, Visual Effects – MVFX (Supervisor – Rod Hodgson), Production Design – Tim Yip. Production Company – Sony Pictures Classics/Columbia Pictures Film Productions Asia/Good Machine International/EDKO Films/Zoom Hunt International/China Film Coproduction/Asia Union Audio-Visual and Culture Co Ltd. The great swordsman Li Mu Bai wishes to retire. He gives The Green Destiny Sword to Shu Lien to take to Sir Te for safekeeping, having realised that the sword is too powerful and has shed so much blood that it should not be used any longer. Li Mu Bai and Shu Lien both love one another but cannot utter their love because she was once betrothed to Li Mu Bai’s brother. However, a masked thief steals the sword from safekeeping. Li Mu Bai finds that the thief is working with Jade Fox who stole a book on fighting technique from the Wudan Mountain school where he trained. Shu Lien discovers that the masked thief is Governor Yu’s daughter Jen, who desires freedom from an arranged marriage in order to be with the desert bandit she loves. A few of us critics have been trying valiantly to turn the public at large onto Hong Kong Wu Xia films for years now and tell people about the wonders of gems like Zu: Warriors from the Magic Mountain (1983), Mr Vampire (1985), A Chinese Ghost Story (1987), Swordsman II (1992), Saviour of the Soul (1991), Butterfly & Sword (1993) and Green Snake (1993). And before that there were the earlier, occasionally fantastical works of the Shaw Brothers that stretch back to the 1960s. Indeed, with its plot about a woman swordfighter and an invincible sword of great power, Crouching Tiger, Hidden Dragon has more than a few resemblances to the Shaw Brothers Vengeance is a Golden Blade (1968), while Ang Lee has recruited Pei-pei Cheng, the most famous of all the Shaw Brothers female fighters, in the role of Jade Fox. People like John Woo and Chow Yun Fat became crossover successes in the West and in the early 00s every action director started trying to copy Hong Kong action moves. However, Wu Xia Pan (fantastical martial arts/swordplay cinema) never moved out of a cult niche in the West until the hit success of The Matrix (1999). Of course, immediately after this every film set out to rip off The Matrix‘s martial arts ballet – the likes of Charlies’ Angels (2000), Dracula 2000 (2000) and tv’s Freedom (2000). Crouching Tiger, Hidden Dragon jumps aboard that same train – it even uses The Matrix‘s martial arts choreographer Woo-pin Yuen – although the irony is that what we have is a genuine Wu Xia film being mounted as a copy of a Western copy of a Hong Kong film. Crouching Tiger, Hidden Dragon arrived in American theatres just after Christmas 2000 with amazing word of mouth, following its smash premiere at that year’s Cannes festival. What was unusual about Crouching Tiger, Hidden Dragon is its director – Ang Lee. The Taiwanese-born Lee premiered with bubbly culture-clash comedies such as The Wedding Banquet (1993) and Eat Drink Man Woman (1994) and moved onto serious period dramas like Sense and Sensibility (1995), The Ice Storm (1997) and Ride with the Devil (1999). Ang Lee certainly has an extraordinary versatility and the ability to soak up and absorb various genres like a sponge. However, Lee taking on as project like Crouching Tiger, Hidden Dragon was at the time akin to say Merchant Ivory deciding to make the next Die Hard film. 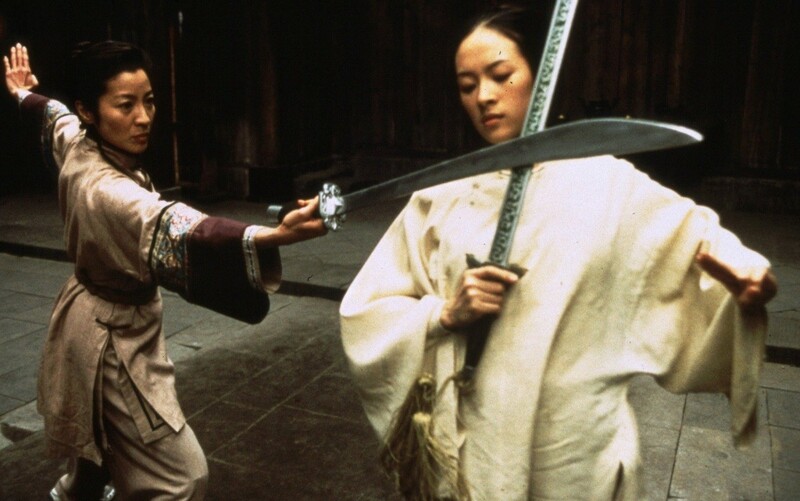 To Ang Lee’s credit, Crouching Tiger, Hidden Dragon is more than a martial arts film – it is far more of a Chinese period drama in the vein of films like Red Sorghum (1987), Raise the Red Lantern (1991) and Farewell My Concubine (1993). (Indeed, the film was sold to the arthouse crowd rather than the action crowd, which is odd considering that the one thing people came out talking about was the martial arts, not the period drama or the romance). Certainly, Crouching Tiger, Hidden Dragon has a much more substantial story than most Wu Xia Pan, which usually tend to regard stories as an unnecessary evil to get to the main action – here it is nearly 15 minutes, for example, before the film erupts into a single martial arts sequence. When the fight sequences do arrive they are expectedly breathtaking. Crouching Tiger, Hidden Dragon is not a fantastic film per se – it does feature a sword that has the quasi-mystical ability to convey near invincibility on its wielder – but its depictions of combatants running on air, flying, dancing up walls and moves that are otherwise a physical impossibility certainly are. The sequences – like the initial confrontation that opens the film up with combatants suddenly fighting up the sides of walls and dancing across rooftops; or the all-out fight between Michelle Yeoh and Zhang Ziyi at the temple – frequently leave the audience clapping. The most poetic of the sequences is the showdown between Zhang Ziyi and Chow Yun Fat with beautiful images of them skipping across water and up into the tops of trees, the branches bending over to touch the ground or they duelling along a slim branch that is bending under their mutual weight. Certainly, Crouching Tiger, Hidden Dragon is far less interesting as the period romantic drama that some critics were determined to read it as. The Chow Yun Fat/Michelle Yeoh romance never takes off. Indeed, Chow Yun Fat, although top-billed, is only a supporting player. The film however is completely stolen by young Mainland Chinese actress Zhang Ziyi who is astonishing (in only her third performance) – she has a plain porcelain face that is an almost transparent indicator of petulant pride. The romance between her and Chang Chen is conducted with some humour upon Ang Lee’s part and is the part that lights the film up, while the aforementioned main relationship between Chow Yun Fat and Michelle Yeoh does not. When Zhang Ziyi gets into the martial arts moves, especially a sequence where she single-handedly takes on around a hundred men in an inn, she completely wipes the entire screen. Crouching Tiger, Hidden Dragon was a colossal success in the West. It became the most successful foreign language film ever released in the US and was nominated for that year’s Best Picture Academy Award where it won the award for Best Foreign Picture, and was nominated for and won a host of Best Foreign Language Film awards elsewhere. Of course, its moves were immediately copied by dozens of Western filmmakers. Crouching Tiger, Hidden Dragon: Sword of Destiny (2016) was a sequel. Ang Lee next went on to conduct the adaptation of the Marvel Comic book with Hulk (2003) and then had equal critical acclaim all over again with the gay cowboy film Brokeback Mountain (2005), before winning an Academy Award as Best Director both with that and the quasi-fantastical Life of Pi (2012). (Winner in this site’s Top 10 Films of 2000 list. Winner Best Actress (Zhang Ziyi) and Nominee for Best Director at this site’s Best of 2000 Awards. No. 8 on the SF, Horror & Fantasy Box-Office Top 10 of 2000 list).